The fourth Nimitz-class carrier is named for the 26th President, former Secretary of the Navy, and leader of the "Rough Riders". The carrier's keel was laid on 31 October 1981, just eight months after similarly named Fleet Ballistic Missile Submarine (SSBN) 600 was decommissioned. The carrier was commissioned 25 October 1986 at NAS Norfolk, VA which is her home-port. This patch does not come with velcro attached. This is large version of the "Last Cruise" patch created for the VF-213 Blacklions and the VF-31 Tomcatters. It shows Felix leaning against a "well-endowed" lady cat with "double D's" and states "LAST TIME, BABY" along the bottom. This truly is a MUST HAVE for anyone that collects!! This is one of the "last Tomcat" patches created for their last deployment onboard the USS Roosevelt (CVN-71). This is truly one of the Tomcat collector's items. This is the "Ho, Ho, Ho Baby!" 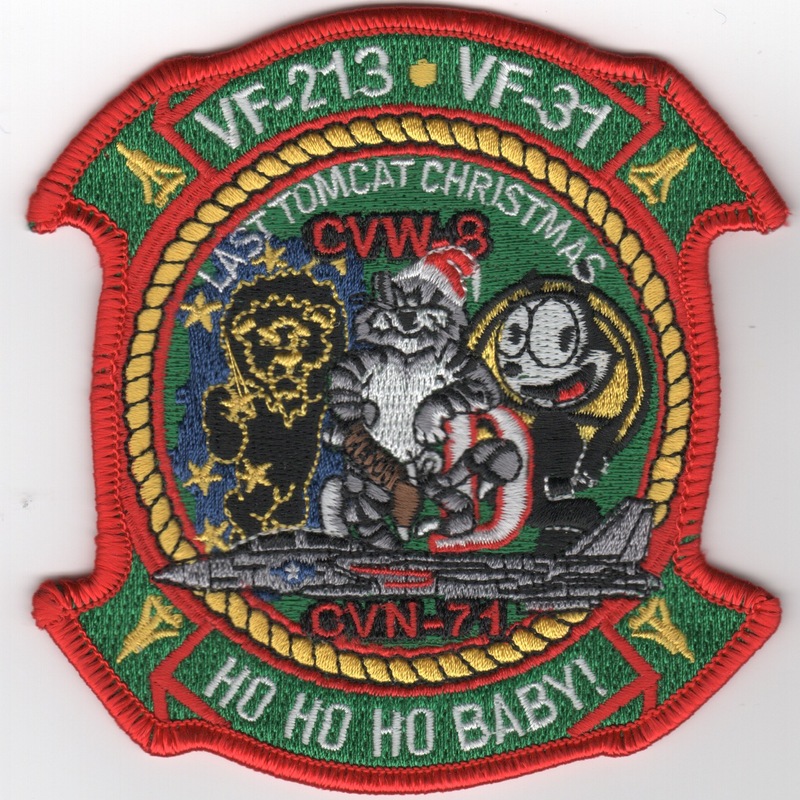 Christmas cruise patch created for the VF-31 Tomcatters and VF-213 Blacklions, CVW-8 and CVN-71. It shows the VF-31 Felix and the VF-213 Blacklion leaning against the modern felix whose wearing a Santa hat. It says "Last Tomcat Christmas" across the inside top of the patch. This another truly MUST HAVE patch for anyone that collects!! This patch does not come with velcro attached. 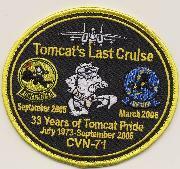 This too is one of the "last Tomcat" patches created for their last deployment onboard the USS Roosevelt (CVN-71). This is truly one of the Tomcat collector's items. This is the 2015 Operation Inherent Resolve cruise patch created by CVN-71 and CVW-1 along with the other squadrons in Carrier Air Wing (CVW) One. It shows a SKULL with a lightning bolt through his eye socket with the Middle East countries in the background and says "CUSTOS VMFA-251 CAELORUM" along the bottom. This patch does not come with velcro attached. 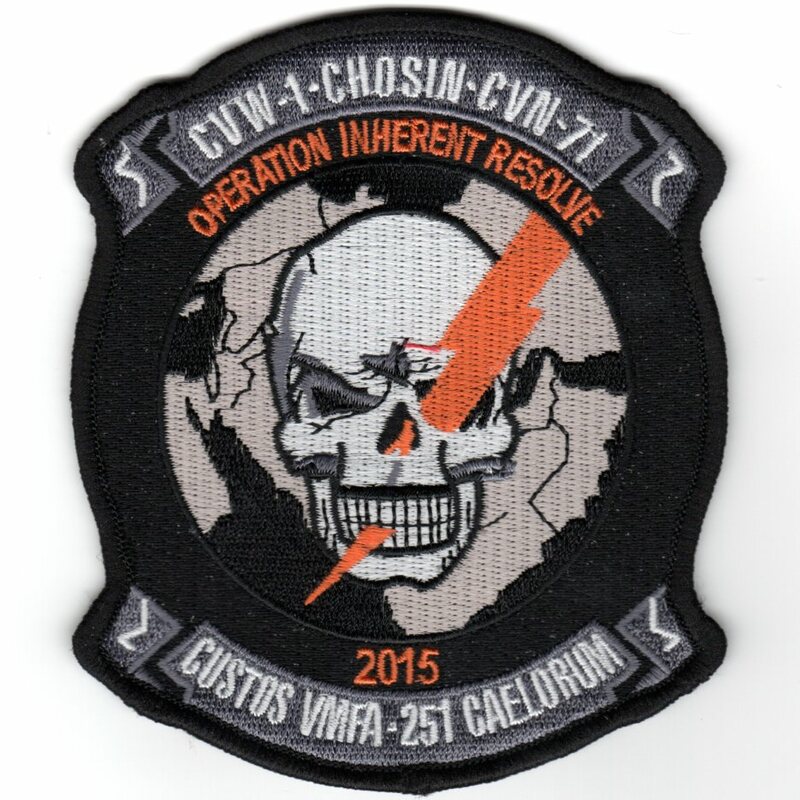 This is the 2015 Operation Inherent Resolve "GAGGLE" cruise patch created by CVN-71 and CVW-1. It shows the carrier with the "gaggle" of squadron insignias around it. This patch does not come with velcro attached. 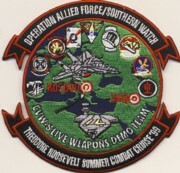 This is the 1999 Operation Allied Force and Southern Watch Cruise patch for the Teddy Roosevelt. It's got the squadron cluster inside the circle with a bullseye over Kosovo and Iraq. It also says "CVW-5 Live Weapons Demo Team" along the inside circle. Man, times were simpler then . . . This is the 2003 Operation Iraqi Freedom Cruise patch for the VFA-15 'Valions' that flew the F/A-18 Hornet off the deck of the USS Roosevelt (CVN-71) as a member of Airwing 8. This is the 2003 Operation Iraqi Freedom Cruise patch for the VF-213 'Black Lions' that flew the Tomcat off the deck of the USS Roosevelt (CVN-71) as a member of Airwing 8. This is the green oval version of the 2003 Operation Iraqi Freedom Cruise patch for the VF-213 'Black Lions' that flew the Tomcat off the deck of the USS Roosevelt (CVN-71) as a member of Airwing 8. It was also created for VAQ-141 and VFA-15. 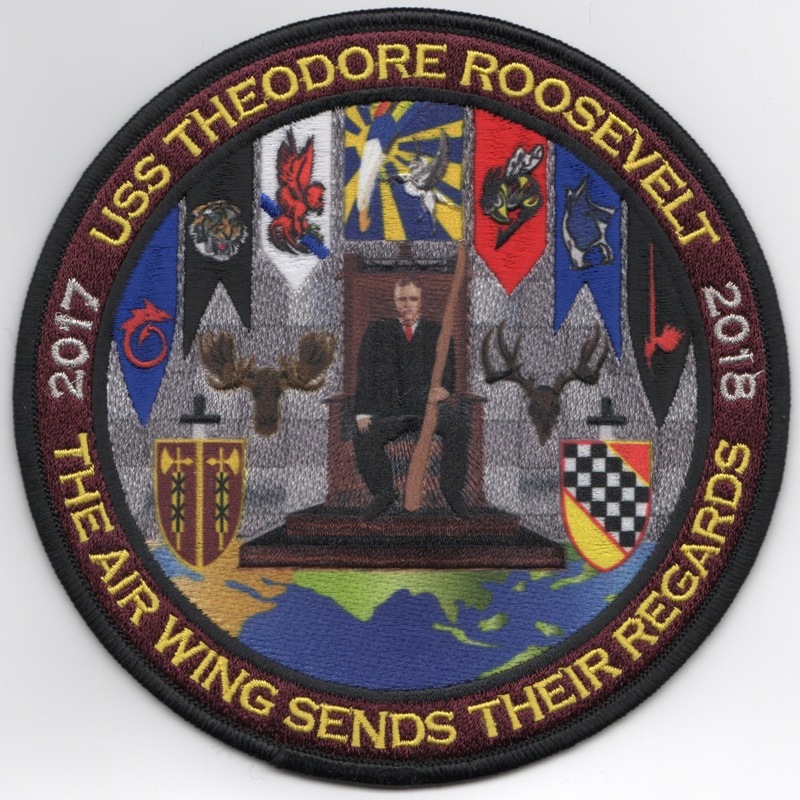 This is the official cruise patch from VFA-82s OEF cruise while onboard the USS Theodore Roosevelt and attached to Airwing 1. 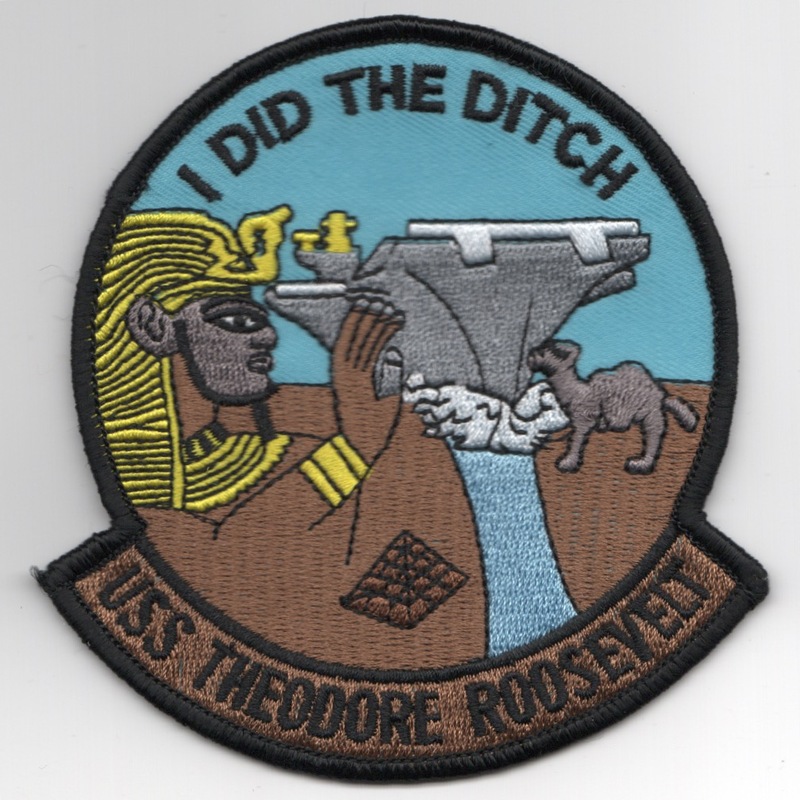 This patch came from the USS Theodore Roosevelt (CVN-71) and Airwing 1 (CVW-1). 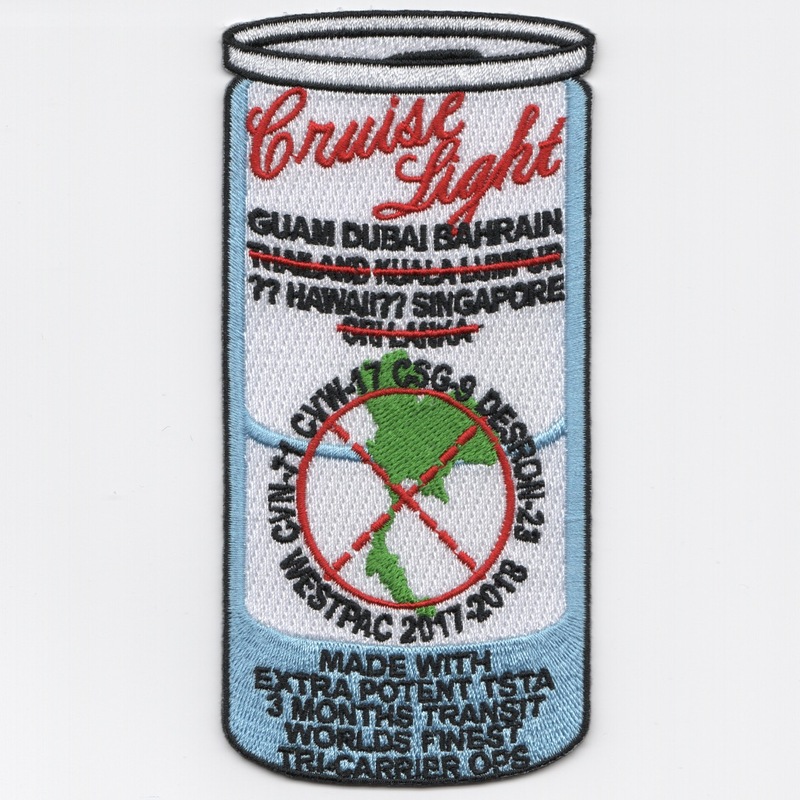 It is the only "OFFICIAL" Operation Enduring Freedom Cruise patch authorized by the ship and does not come with velcro attached. It came directly from their Mess and shows all the squadron designators and aircraft with a large Eagle on final!. 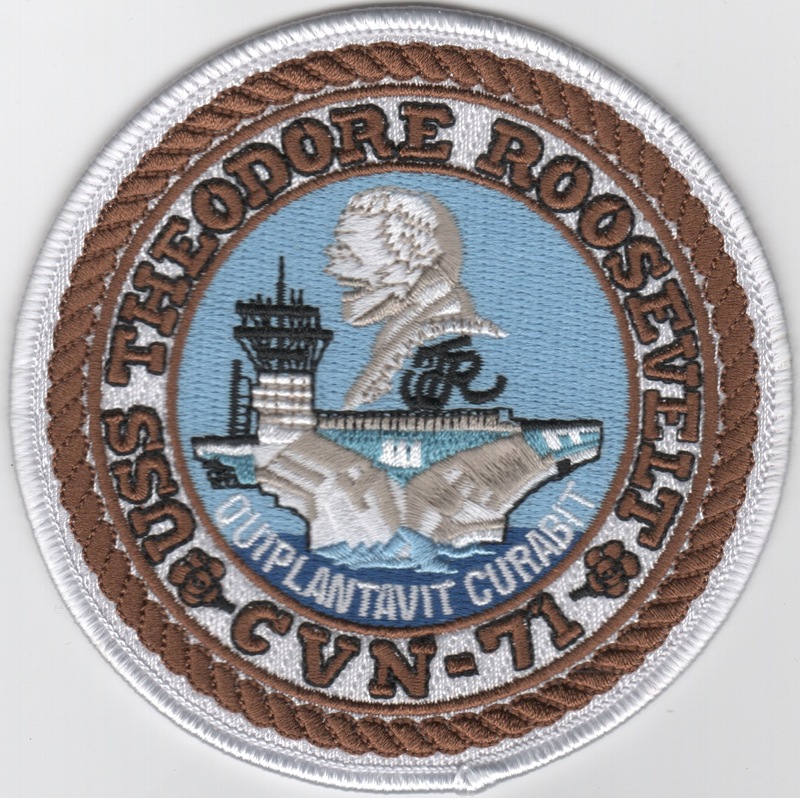 This cruise patch comes from CVN-71, the USS Theodore Roosevelt. It's one of the "LAST TOMCAT" cruise patches being created for VF-31 and VF-213's last cruise. It states "Size Does Matter" for their OIF tour of 2005-2006 and shows missiles being targeted. 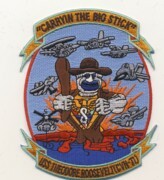 This is one of the cruise patches created for Airwing 3 and the USS Roosevelt (CVN-71) for their 1997 Mediterranean cruise. It shows "stars" indicating their 6 port calls. 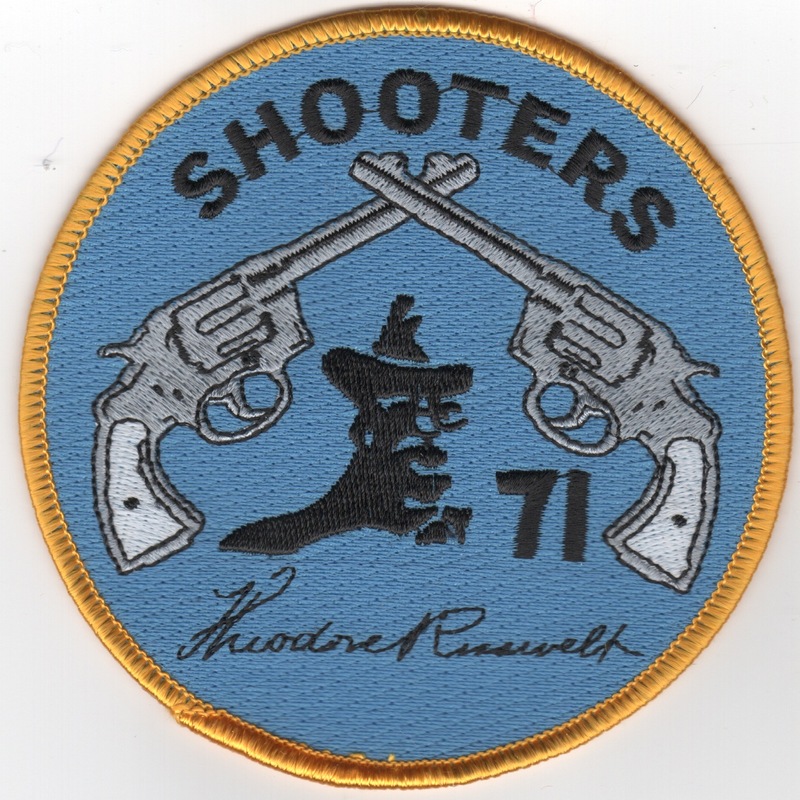 This patch was created by CVN-71, the USS Theodore Roosevelt. When you pass through the Suez Canal from the Mediterranean Sea to the Red Sea, you "Do the Ditch". Most carriers at one time get through there during there cruise. 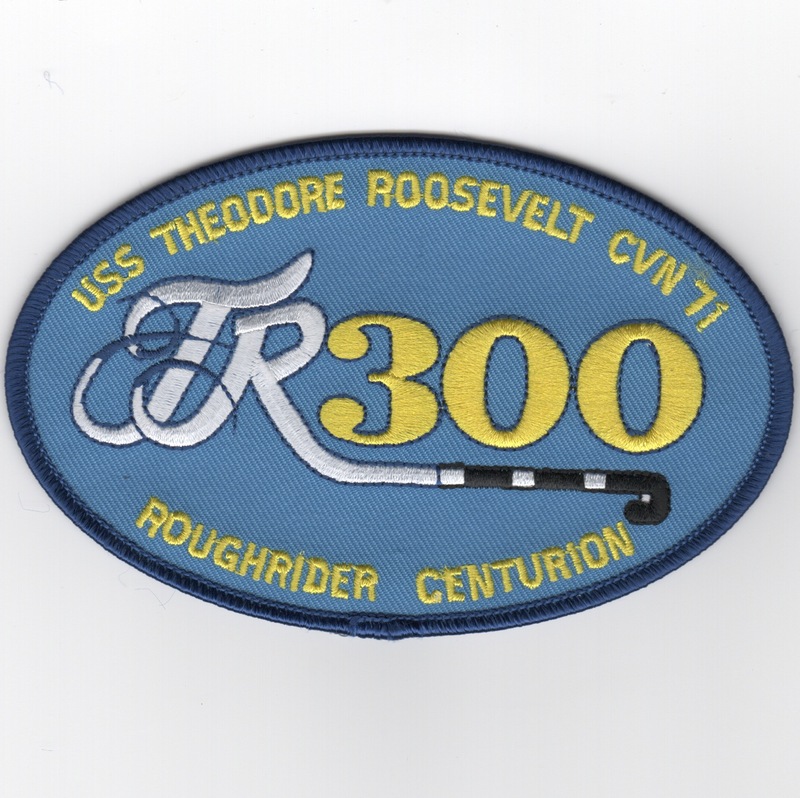 This is the cruise patch from the USS Theodore Roosevelt and Air Wing 8 back in '99. It is in the shape of a waving flag and shows 'Teddy' holding a "big stick". 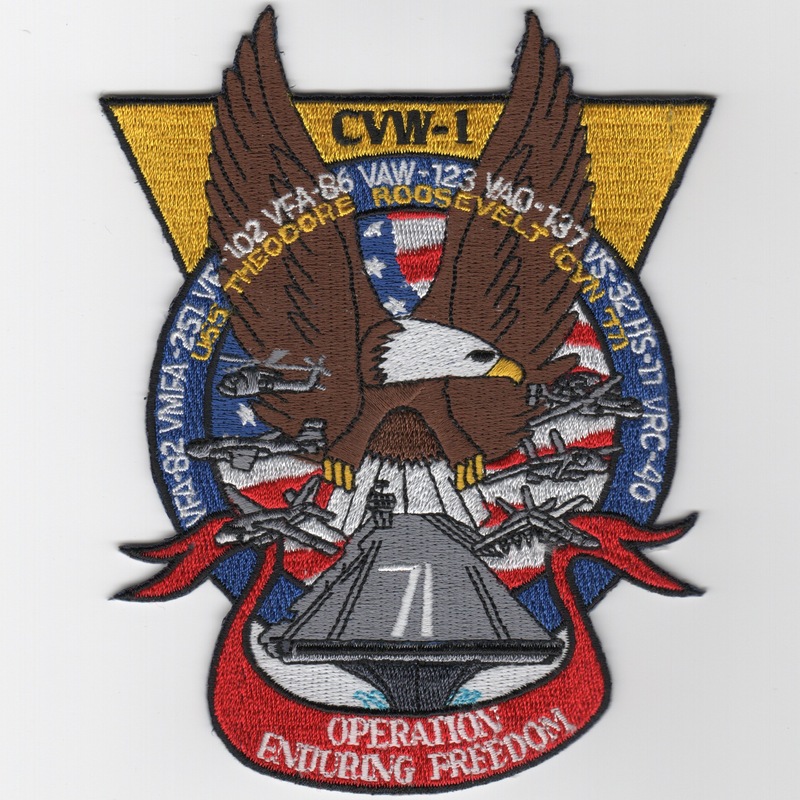 This is one of 6 of the CVN-71/CVW-8 Kosovo Crisis Cruise patches in 1999. This is the cruise patch from the USS Theodore Roosevelt and Air Wing 8 back in '99 during the Kosovo Crisis. It has the most famous saying from Teddy Roosevelt, and it applied to the conflict over there...."Walk Softly and Carry a Big Stick". This is one of 6 of the CVN-71/CVW-8 Kosovo Crisis Cruise patches in 1999. This is the cruise patch from the USS Theodore Roosevelt and Air Wing 8 back in '99 during the Kosovo Crisis. This one denotes the fact that even though the Iraqi targets were few and far between, the Balkans provided an ample supply. This is one of 6 of the CVN-71/CVW-8 Kosovo Crisis Cruise patches in 1999. This is the cruise patch from the USS Theodore Roosevelt and Air Wing 8 back in '99 during the Kosovo Crisis. This one denotes the official name of the conflict, "Operation Noble Anvil". This is one of 6 of the CVN-71/CVW-8 Kosovo Crisis Cruise patches in 1999. This is the cruise patch from the USS Theodore Roosevelt and Air Wing 8 back in '99 during the Kosovo Crisis. This one shows the carrier from God's Eye view, as well as the American flag and the location of the Balkans. This is one of 6 of the CVN-71/CVW-8 Kosovo Crisis Cruise patches in 1999. 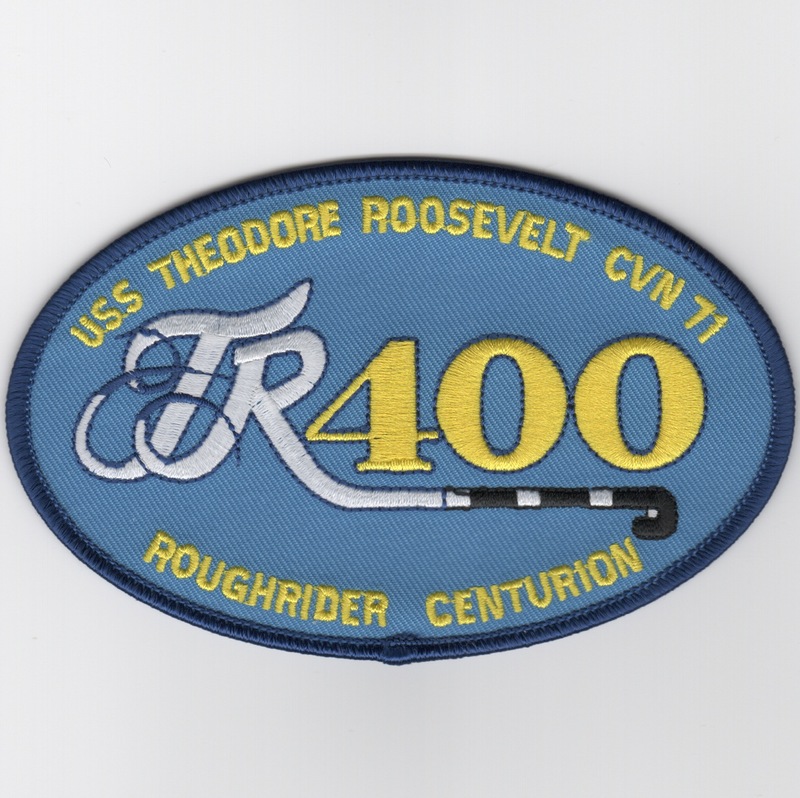 This is the USS Teddy Roosevelt (CVN-71) 1995 Cruise Patch. It is a fairly large patch with the energizer bunny on the front. It says "ADRIATIC YACHT CLUB '95" across the top and "Cruising...and Cruising...and Cruising" across the bottom. The cruise was in support of Operation Deny Flight (UN involvement). This patch does not have velcro attached. 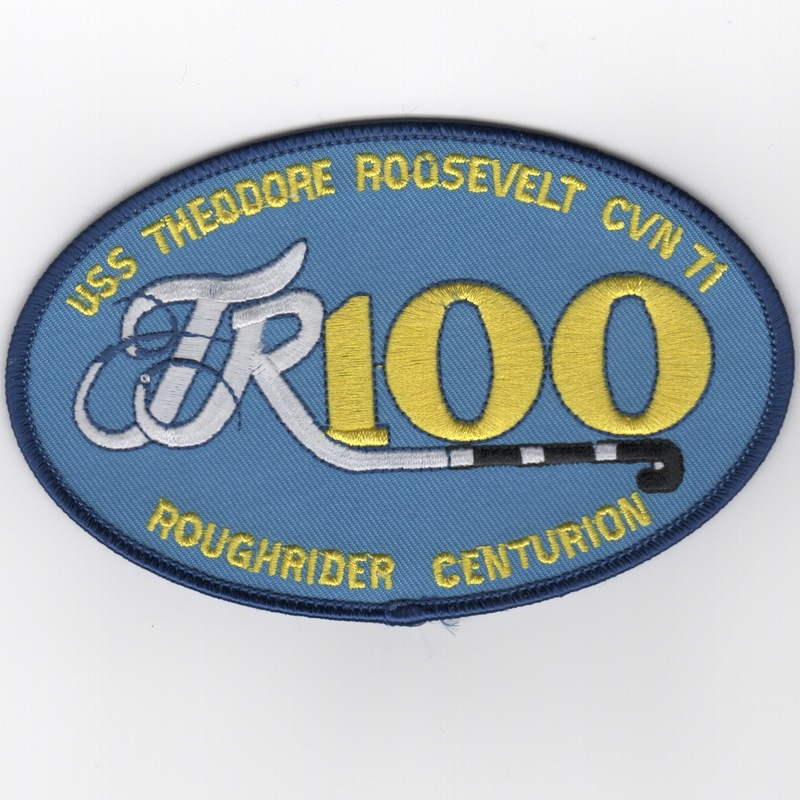 This is a cruise patch for CVN-71 (USS Teddy Roosevelt) for their OEF cruise in 2005-06. It is a rectangular patch that is designed after the great flik "Team America". Puppets . . . yuck. 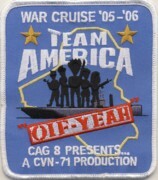 The patch says "War Cruise '05-'06" across the top then "TEAM AMERICA" in the middle. It also says "CAG 8 Presents... A CVN-71 Production" across the bottom. I'm soooooo lonely . . . (if you've seen the movie you'd understand). This patch does not come with velcro attached. This is the USS Truman (CVN-71) 2009 Cruise Patch. It is a large circular patch. The cruise was in support of OEF. It has the various squadrons included along the top of the patch. Very detailed patch, but very simple as well. Whoever the designer was didn't put much thought into it. This patch does not have velcro attached. This is the "100 Traps" Centurion patch given to those who have 100 "Daytime" Traps onboard the USS Theodore Roosevelt (CVN-71). 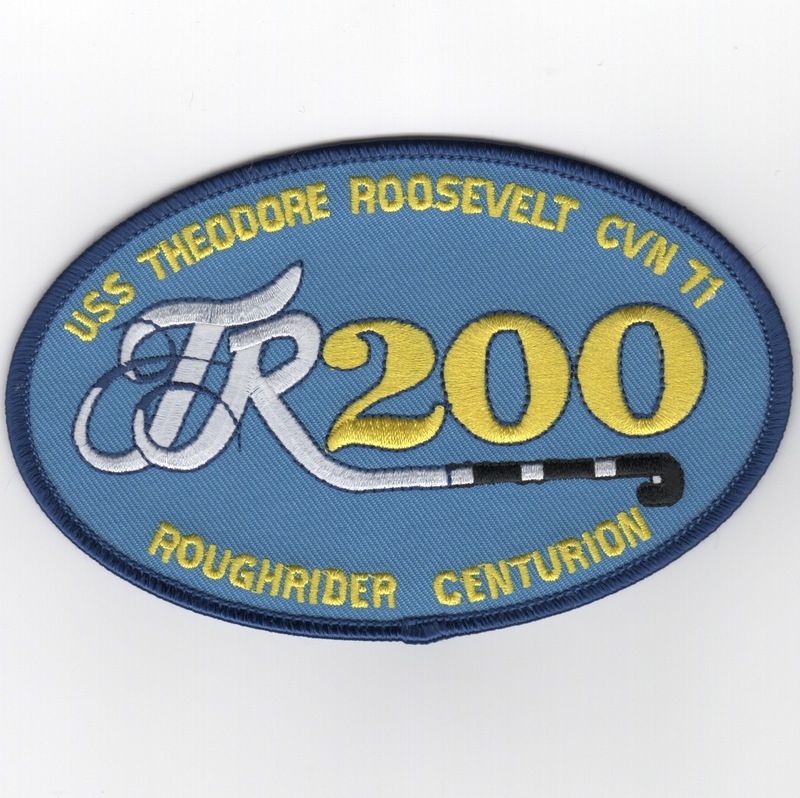 This is the "200 Traps" Centurion patch given to those who have 200 "Daytime" Traps onboard the USS Theodore Roosevelt (CVN-71). This is the "300 Traps" Centurion patch given to those who have 300 "Daytime" Traps onboard the USS Theodore Roosevelt (CVN-71). This is the "400 Traps" Centurion patch given to those who have 400 "Daytime" Traps onboard the USS Theodore Roosevelt (CVN-71). This is the blue version of the CVN-71 'SHOOTERS'. This one has "crossed pistols" in gray thread and does not come with velcro attached. 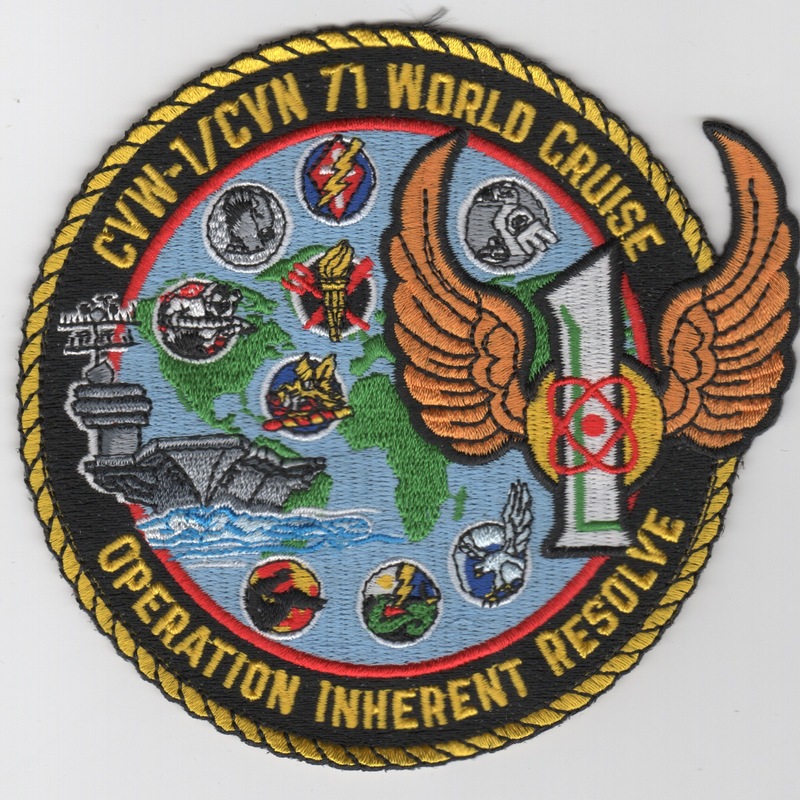 Homepage | Order CVN-71 Cruise Patches!